A replacement set of 4 black snap-on combs to fit the square blade of the Andis T-Liner Trimmer. 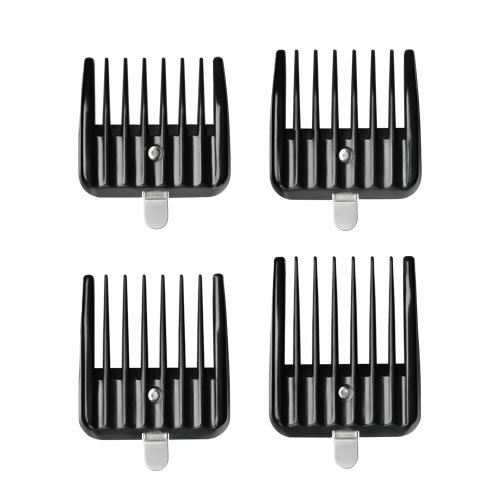 These are the same as the 4 (of 12) combs supplied with the T-Liner designed to fit its square blade. Also fits the Andis Outliner II, BMC and D-2. £4.75 (inc. VAT) Why no VAT? We're a trade wholesaler and quote our prices without VAT to help our VAT-registered customers understand the true cost of a purchase. Replacements for 2 of the blades supplied with the Andis T-Liner Combo (also fit the Andis Superliner). Choose from: Square (#32290) or Wide (#32425).